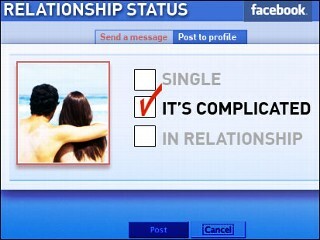 I changed my relationship status from blank to “single” earlier this week on Facebook. Several of my Fb friends thought I’d just been through a break-up. The truth is that I’ve finally made it up in my mind that I’m ready to date again. After my divorce in `04 an old boyfriend came back into the picture, but that went nowhere. I dated a nice single dad for awhile, but it wasn’t a good match. That pretty much explains the action in my love life since I said so long to Osama (my affectionate name for my ex). I have to take some responsibility for snoozy-ness in the romance department . Introduction offers have been shrugged off, internet dating poo-poo’d, the singles ministry at church ignored. The dreaded double-nasty of a bad marriage followed by a bad divorce can be a major relationship turnoff. I heard one counsellor say it takes at least 18 months to recover from divorce… my friend’s church counsellor told him it was a MINIMUM of two years. You have to figure out what works for you. A good rule of thumb is you feel confident that you won’t repeat the same old mistakes. I’ve got the relationship confidence, but I’m still very leary of internet dating. For the second time in six years, I’ve put a profile on a dating site. No dates yet. This time around I refuse to even put up a profile picture. I don’t want these guys to know what I look like before I get a chance to feel them out by e-mail. Heck, a couple private messages I received after changing my Fb status freaked me out. I’m afraid there might be some real creep-nasties out there. Perhaps I’m just too much of a punk for computer love.